The rise of the arcade game - This Is My Joystick! Gaming continues to progress further and further as the years go by. Whether that be with graphical improvement, mesmerizing storytelling or smooth gaming mechanics, the industry is continuing to move forwards with no sign of slowing down anytime soon. The market is changing, and what gamers want is also changing. What’s next though? With the introduction and growth of the Xbox Live Marketplace and the PlayStation Store over the past several years, more and more games are being released on a smaller scale for much more reasonable prices than their retail friends. I’m not just talking a simple 2D side-scroller, or even a plain puzzle game. I’m talking full games with style, substance and massive replay value. The online marketplace is becoming somewhere for the lesser known developers to create a name for themselves, and make a massive breakthrough into the market. Even some Indie titles have massive appeal to those who manage to sift through the massive back catalogue to find those worth playing. The best thing about all of this? It’s dirt-cheap. An indie game will set you back as little as 80MSP (a mere 68 pence), but even a fully developed Arcade game will only set you back between 800MSP and 1600MSP (roughly between £6.80 and £13) at most. This is a small price to pay for quality. Some Indie titles are painfully simple and sometimes immature. You will never pay over the odds for a decent game from the Xbox Marketplace that has had a lot of love and care put it into it. LIMBO has been a recent example of this. True, it was like the marmite of the Arcade universe but there is no doubting that even though it was slightly overpriced at the time it was released, it was a beautiful piece of gaming art. It may have been simple, but a bit of simplicity is nice every once in a while. The XBL Marketplace and PS Store even allow old classics to be released at a much more affordable price. There are even cult classics from the mostly flawed Dreamcast available in these online stores. Ports from the PC and of course classic consoles have been released on both stores at bargain prices. Torchlight was a PC classic that worked well once adapted to work on the Xbox 360, and the PlayStation boasts so many classic PS1 games on its store that there is certainly no shortage of classic games to play. I have not seen a classic title on the PS Store that I am interested in that would cost more than £10. If that isn’t a bargain, then I’m clearly looking in the wrong places. 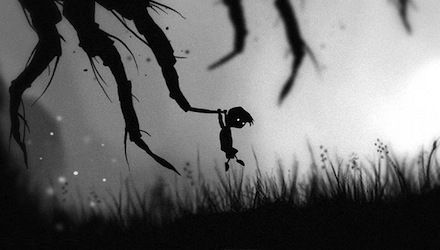 LIMBO was a beautiful and affordable game. These marketplaces are also allowing console gamers to keep up with PC gamers. As much of a brutal truth as it may be, PC gamers and console gamers always bicker about what one has that the other doesn’t. With all these ports for consoles there will of course still be some friction, but the XBL Marketplace and the PS Store is a steady competitor for the PC gamers equivalent, Steam. With all of this going on though it makes me wonder if the entire industry is going to go completely digital soon. In the next ten years, could we see the removal of high street stores and online retailers altogether? With these cheap prices, and even Games on Demand becoming increasingly popular due to price and convenience, I can personally see this becoming a reality sooner rather than later. Retailers are struggling to survive in terms of games sales, increasing prices to try and make some money but evidently losing out to the online market instead. From a personal point of view I sincerely hope that the games market doesn’t go entirely digital. It would be a shame to see the high street games retailer fall to its knees due to the online market, as spending hours searching through racks of games in store holds a certain amount of fun and therapeutic value for me. As lovely as the convenience of the online market is I don’t think you can beat buying a game in store, holding onto the brand new case and flicking through the fresh pages of the instruction manual. Owning a game is mostly a material thing for me, and even though I own a lot of Arcade titles I would much rather spend £40 or more on a brand new physical game, than £15 for a virtual collection of images and sound stored on a hard drive that I can never touch.